Margot Robbie And Nicole Kidman’s Fox News Movie Just Hit A Serious Roadblock. An impressive all-star-led film about Roger Ailes, former chairman and CEO of Fox News, has been in development for a few months now, and in recent weeks it has been gearing up for the start of production. However, in a surprising turn of events, the film will now likely face delays, given that Annapurna Pictures has dropped the title. The untitled Roger Ailes project, starring John Lithgow, Charlize Theron, Nicole Kidman, and Margot Robbie, is currently without a studio, according to The Hollywood Reporter – which cites that the move may have been made because of the film’s $35 million budget. That means that it is currently homeless, but that state may not last long. Filling the vacuum, BRON Studios, which has produced titles including Fences, The Birth of a Nation, and A Simple Favor, has signed on to co-finance the production, and Focus Features, Amblin and Participant Media are reportedly in talks to acquire the film. The project about Fox News stars John Lithgow as the late Roger Ailes, who was tapped by media mogul Rupert Murdoch in 1996 to helm Fox News and Television. The executive was fired in 2016 by Murdoch after women, including television hosts Gretchen Carlson and Megyn Kelly, accused him of sexual misconduct in the workplace. Malcolm McDowell signed on to play Murdoch yesterday and Nicole Kidman and Charlize Theron have signed on to play Carlson and Kelly, respectively. Margot Robbie is also set to star in the upcoming film as Kayla Pospisil, a fictional Fox associate producer. The film is being helmed by the director behind Trumbo, Austin Powers and Meet the Parents, Jay Roach, and the screenplay writer of The Big Short, Charles Randolph, is penning the script. Also featured in the star-studded main cast is Saturday Night Live’s Kate McKinnon. The Fox News project starring a talented ensemble cast currently does not have a release date, but that should change when the film finds a new production company/distributor. We’ll continue to follow the development of this project as it continues. New photos have surfaced onset of Margots next project, ‘Once Upon A Time in Hollywood’. Filming in LA on the 5th September. Robbie received an Academy Award nomination for best actress for her portrayal of Tonya Harding in “I, Tonya,” which she produced as well under her LuckyChap banner. She will next star as Queen Elizabeth I in “Mary Queen of Scots” for Focus Features alongside Saoirse Ronan. Robbie is in production on Quentin Tarantino’s “One Upon a Time in Hollywood,” playing Sharon Tate, and will next play Harley Quinn in the untitled “Birds of Prey” film for Warner Bros., which she is also producing. Schoenaerts can next be seen in David Oelhoffen’s “Close Enemies,” premiering at the Venice Film Festival; Thomas Vinterberg’s “Kursk,” which will have its premiere at the Toronto International Film Festival; and Laure de Clermont-Tonnerre’s “Mustang,” which Focus Features will be releasing next year. Robbie is represented by Management 360, CAA, Aran Michael Management and attorney Jeff Bernstein. Schoenaerts is represented by CAA and UBBA in Europe; and Kurzel by CAA and Katie Richter in Australia. Ryan and Matthew Firpo are represented by UTA and LBI Entertainment. Margot recently posted a photo on Instagram of her in character for her next project currently in the works playing the infamous Sharon Tate who was brutally murdered by cult leader Charles Manson’s followers. The movie titled “Once Upon A Time in Hollywood” which has been written and directed by Quentin Tarantino, is set to be released in August next year. She stars alongside Leonardo DiCaprio and Brad Pitt amongst other big names. Fox News movie: Margot Robbie joins Nicole Kidman and Charlize Theron. Margot Robbie is reportedly in talks to join Nicole Kidman and Charlize Theron in Annapurna’s upcoming film about the Fox News sexual abuse scandal, according to the Hollywood Reporter. Kidman is slated to play former Fox News anchor Gretchen Carlson, who blew the whistle on the company’s culture of sexism and harassment when she and more than two dozen other women accused chairman and CEO Roger Ailes, who died in 2017, of sexual harassment. Theron, who is also a co-producer, will play Megyn Kelly, another former Fox News anchor who said she experienced “explicit quid-pro-quo sexual harassment” at the hands of her former boss, Ailes. Robbie, fresh off an Oscar nomination for her role as Tonya Harding in I, Tonya, will reportedly play an associate producer at the network. The film, which has yet to be titled, will be written by The Big Short screenwriter Charles Randolph and directed by Jay Roach, best known for directing 2015’s Trumbo and the Austin Powers films. The project is the second so far to zero in on Ailes’ 20-year reign at Fox News and the toxic culture that spawned from it. Showtime recently picked up an eight-episode series based on Gabriel Sherman’s Ailes biography and Fox News exposé The Loudest Voice in the Room. Russell Crowe will play the disgraced network chairman. According to the Hollywood Reporter, the Annapurna project will be an ensemble, which means other prominent figures in the Fox News orbit – like former 21st Century Fox CEO Rupert Murdoch, former anchor Greta Van Susteren and axed host Bill O’Reilly – may be included. 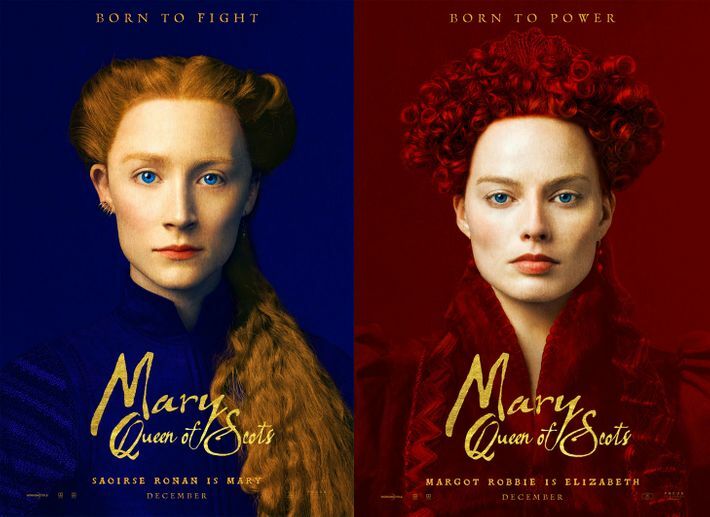 Get your first look at the posters for Margot’s next upcoming movie “Mary, Queen of Scots”, starring alongside Oscar nominee, Saoirse Ronan. The movie is set to be released at the end of this year! Margot Robbie is set to reprise her Suicide Squad role as Harley Quinn as many as four times in the next couple of years. For now, though, her mind is on the first of those projects, Birds of Prey. As well as playing Harley, she’s also producing the movie and now she’s confirmed exclusively to Flickering Myth that shooting starts in January 2019. Birds of Prey is a DC Comics series featuring an all-female line-up of heroes. Which characters will appear in the film hasn’t been revealed, but Batgirl, Black Canary and Huntress are emerging as the favourites to keep company with Robbie’s Harleen Quinzel. Director Cathy Yan and screenwriter Christina Hodson are already attached. No release date for the film has been revealed so far, but we may get an official announcement later this month during Warner Bros.’ DC Films panel at the San Diego Comic-Con International.